Your time and attention is appreciated, particularly for those who have traveled more than 8 hours to address you this morning. We have come before you to share our voices and to commend the progress this institution has made on sustainability issues. We are also here today to outline our vision for advancing the University of California’s commitment to environmental and social leadership, particularly in regard to the impending threat of climate change. UC has been a leader in research on climate change. Our campuses have committed themselves to reducing consumption and increasing energy efficiency. We are excited about the UC’s official commitment to reducing its greenhouse gas emissions and achieving climate neutrality over the coming decades as outlined in the University’s most recent climate report. From providing courses of the highest standard on climate change to implementing energy efficiency in their lecture halls, the UC’s commitment to environmental stewardship has been impressive and must be commended. [Eli Willis, UCSC] However, the UC’s on-campus climate initiatives and world class environmental education will have little meaningful impact if we fail to address the root of the problem. The production, extraction and consumption of fossil fuels threatens the stability of our ecosystems, forces indigenous peoples off their lands from Canada to Nigeria, exacerbates climate change, corrupts the integrity of our democracies, poisons our air, land and water, and poses probably the greatest threat to the long term survival of our species let alone this university and its students. [Ashley Ellis, UC Berkeley] With this, we’d like to formally introduce ourselves. 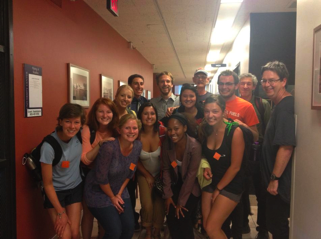 We are students from the California Student Sustainability Coalition and the Fossil Free movement. 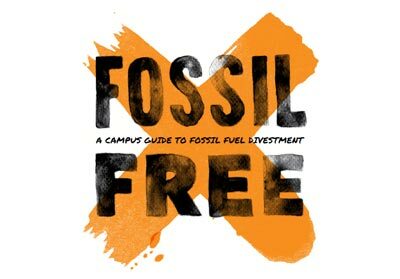 Fossil Free, active on more than 350 campuses across the nation, is a response to ever-increasing threats of climate change, pollution and social exploitation, all direct consequences of our dependency on a fossil fuel economy. 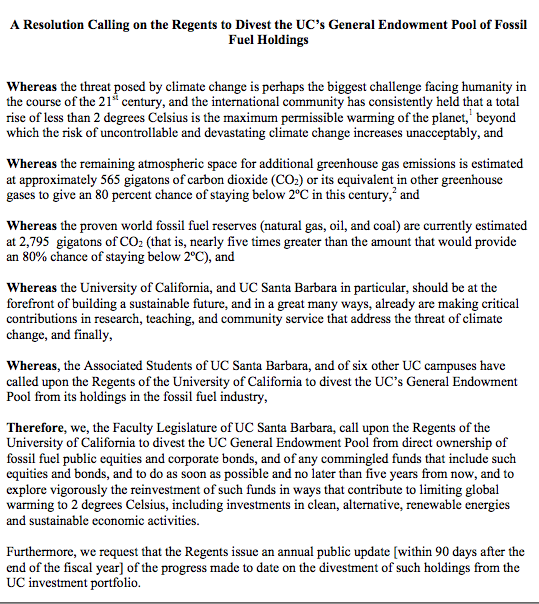 Our demands are prudent and clear—we are asking the UC system to freeze all new investments in the 200 publicly traded fossil fuel companies with the largest carbon reserves, while agreeing to develop a plan to remove all investments in these companies over the next 5 years. To move this forward, we would like to work with you to put fossil fuel divestment on your agenda come September. The decision to divest from fossil fuels is one rooted in moral imperative as well as fiduciary responsibility. Let us start with the moral argument. If it wrong to wreck the Earth’s climate and the livelihoods of millions in the process, then it’s wrong to profit from that wreckage. [Sarah Angulo, UCSC] There are three numbers that illustrate the need for immediate action to avoid certain climate catastrophe: 2 degrees centigrade, 565 gigatons, and 2,795 gigatons. These correspond, respectively, to the very utmost warming humans can undergo and still have a reasonable chance of avoiding climate catastrophe, the amount of carbon we can burn and still remain below 2 degrees centigrade, and the amount of carbon fossil fuel industries have in their reserves and plan to extract and burn. It is crucial to note that 2,795 gigatons of carbon is 5 times higher than the amount of carbon even the most conservative estimates say we can burn and have a 50% chance of remaining below 2 degrees. By continuing to search for new hydrocarbons and extract some of the crudest sources of energy like the Alberta Tar sands, it has become clear that the fossil fuel industry has no intention of meeting this requirement. Our institution’s investments in this industry illustrate tacit support for a business model that threatens all of our futures. [Emili Abdel-Ghany, UC Davis] We’ve heard critiques left, right and center that divestment won’t fix the problem, that only individual consumption habits can stop climate change; that it is hypocritical because we continue to burn carbon in all aspects of our daily lives; that fossil fuel industries also invest in renewable technology; that tuition fees will rise; that the UC will lose money; that coal as the dirtiest fossil fuel should be the target and not oil or gas. Each critique, while based in legitimate concerns, is not sufficient to justify remaining invested in this industry. By divesting from fossil fuels, we are choosing to align our investment portfolio with our stated values and goals. Divestment is a statement that our university wishes to fulfill its fiduciary responsibility and make financial decisions which truly benefit the institution and the Earth in the long run. We will be back in July with a detailed report addressing the aforementioned critiques. [Alexandra Ballinger, UCSB] Our goal isn’t to cripple the industry financially; our goal is to remove their social license to operate. This movement is already beginning to reinvigorate the national and international conversation about solving the climate crisis, and what steps needs to be taken immediately to begin this process. It is only once this important step has been taken that we will be able to wrest our democracy from the influence of the industry’s lobbyists and allow our politicians, business leaders, and society as a whole to pursue truly sustainable policies. Divestment is a tactic to promote vast-scale public dialogue on climate change. And we desperately need dialogue. Climate change has all but vanished from the political agenda. It must re-emerge as the defining crisis of our generation. Think about the kind of discussion that will be ignited when 500 universities collectively pull out of investments in the fossil fuel industry. Think what this does to the credibility of their lobbyists in Washington Think about the significance of America’s scientific and academic community united in their opposition to the practices of the fossil fuel industry. Divestment is the tactic to ensure that this crucial dialogue explodes across mainstream media and public discussion. 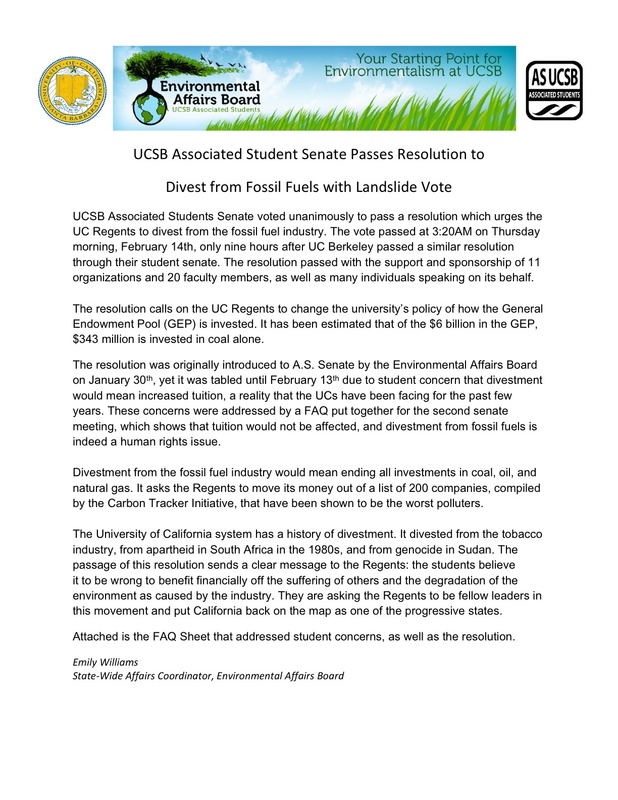 [Quentin Gee, UCSB] Divestment as you all know is a tactic that has been employed several times by this institution with Sudan, South Africa, and tobacco. Divestment from the tobacco industry told the world that America’s intellectuals could not endorse an industry that sold and advertised products known to drastically increase the risk of cancer, never before has smoking been so stigmatized. Divestment from South Africa told the world that America’s intellectuals were not prepared to support the racist and violent regime of apartheid South Africa, shortly afterwards that regime fell. Divestment works. With our divestment from apartheid in South Africa, the first trip Nelson Mandela took when he got out of jail was to UC Berkeley to thank the UC students for demanding divestment, a tactic that was largely responsible for ending apartheid. I would like to point out that we have set precedent. On November 14, 2005 the committee of investments said that they will pursue divestment “only in reaction to the most repugnant governmental policies and industry practices.” What the speakers here have already shown is that the fossil fuel industry is in no way concerned with the well-being of our planet, of our society, of human rights, or with any other concerns we have. And that seems pretty repugnant, and these practices are not something that we want to continue to say is ok by investing in. [Zen Trenholm, UC Berkeley] Today, we are experiencing what many financial experts refer to as a “carbon bubble.” When governments finally step in to prevent the extraction of these fossil fuels we will see that bubble pop. It will make the housing bubble recession look insignificant in contrast. Our society has been powered on a false promise of energy security, and that power source is undermining the very fabric of our way of life. Indeed, financial institutions are beginning to wake up to this false promise. In the last year HSBC reported that if governments take action on climate and cap global warming at 2 degrees, fossil fuel companies will no longer make large profits. Instead, moving investment out of fossil fuels into renewables will provide long term financial benefits for everyone involved. We are in an excellent position to push forward these new, mission-aligned investments while generating returns for the UC system in the long-term. Our report we will be handing you in July will be comprehensive in its outline these arguments. Yet we also realize that the increase risk of fossil fuel divestment is miniscule compared to social and environmentally hazardous practices of the fossil fuel industry and the threat of climate change. [David Shugar, UCSC] We realize that one of the fiduciary concerns is to choose profitable investment strategies, and I want to quote a study which studies fossil fuel investments as well as the associated negative consequences. In Do the Investment Math: Building a Carbon Free Portfolio, a study conducted by the Aperio Group, the benchmark portfolio, Russell 3000 was compared to the same portfolio with a complete exclusion to the fossil fuel industry. Through multi-factor model computer forecast based on real historical values, such as price-earnings ratios, it was found that the increase in return risk between the benchmark vs. the fossil free exclusion was predicted to be only 0.01%. Is 0.01% enough to stop us from moving away from fossil fuels? I believe that 0.01% is minimal. Also, when doing a historical back-test for the years 1997-2008, they found that the fossil fuel exclusion portfolio performed better than the benchmark. Although future investment risk may never be predicted with accuracy, we want to make the case to you that the risk of divesting in fossil fuels is nothing compared to the tremendously negative consequences of the fossil fuel industry; such as releasing gigatons of carbon into our atmosphere, using undisclosed carcinogenic chemicals for hydraulic fracturing, the increase rates of cancer near coal factories, and countless other unregulated practices such as mountaintop removal. We deserve to live in a healthy planet and we need to stand up for our rights and for the lives of our future generations. Fossil fuel divestment is a very influential and important movement in the right direction, with small investment risk. Let’s stand up for a future that is not threatened by the very industries that we create. [Ophir Bruck, UC Berkeley] In addition to the financial arguments, I’d like to reiterate the moral imperative for divesting from the fossil fuel industry. As an institution comprised of its students, educators, and leaders, it is our moral duty to “serve society as a center for higher learning, providing long-term societal benefits through transmitting advanced knowledge.” This is taken directly from the UC’s mission statement. It is contradictory to our mission statement to be invested in, and subsequently endorsing, the very industry whose business model makes climate change education necessary in the first place, and ensures that we will not have a viable future upon which to enact our advanced knowledge. It is therefore crucial that we reassess what it means to serve society in the long-term, directing our attention towards our portfolios and ensuring that our investment practices are aligned with our stated values and goals. [Chris H, UCSC] We, the students before you here today, are the ones who will be on this planet for other 60, 70 or 80 years. In that time climate change, climate chaos will have affected all of us. We are the ones who will have to explain to our children what it was like to live in a beautiful world: with fresh water, breathable air, and Pacific islands still above sea level. We are the ones who will have to explain; so we have the right. It is we who will be the world’s leaders, trying to clean up after the mess history’s most exploitive industry left behind. And the UC students know it! Divestment has their support. So far, 7 student senates from 7 different campuses have passed resolutions in support of divestment. As we speak, UCSB’s faculty senate is considering the same. And we’re not alone in this! Several of our neighboring cities–San Francisco, Berkeley, Richmond–have already committed to divestment! [Ronin Souza, UCSC] Speaking for the students, it’s vital that we set the precedent at the UC-level of how we run our institution. We both want the same thing: a future in which to enact the education we’ve gained as students. But while the university spends so much money, time and effort on us, training us to be tomorrow’s leaders and engineers, it also profits of the very industry which will ensure we have no suitable world to lead. Our very own Scripps Institute at UC San Diego announced exactly one week ago that for the first time in human history we hit a carbon dioxide concentration in the atmosphere of 400 ppm. James Hansen, former NASA climate scientist, said “If humanity wishes to preserve a planet similar to that on which civilization developed and to which life on Earth is adapted….CO2 will need to be reduced … to at most 350 ppm.” No financial or feasibility claims against divestment can trump the fact to do nothing is to betray the trust of future generations. Do nothing is not an option. [Theo Lequesne, UCSB] Don’t worry, I’m the last one you’ll have to listen to today. Today. Divestment is a statement, and our money is our voice. It says that it is morally wrong to financially benefit off the suffering of others, the degradation of the environment, and sacrificing the very future of humanity. As Bill McKibben puts it: “If it is wrong to wreck the climate, then it is wrong to profit from that wreckage.” What divestment does is it shows that America’s intellectual powerhouses stand against that wreckage, stand against the institutionalized insanity of the fossil fuel industry, stand against the injustice of denying my generation of a livable future. Divestment says that the UC system, which is the equivalent of California’s largest corporation, recognizes the incredible danger posed by fossil fuels. It says that we’re smart enough to no longer support them. And it proudly declares that America’s future leaders want no part of fossil fuels, that they cannot and will not support an industry as reckless and dangerous as the fossil fuel industry. You may have seen us outside this morning, or heard us, we symbolically chained ourselves to an oil derrek, and we symbolically handed you the keys to unlock us from a fossil fuel future. But that is where symbolism ends and reality begins. You have the power to unlock us from this future. So that is who we are, and divestment is what we want, it is what we came here today to ask that you will listen to us, you will take it seriously, and you will put it on the agenda this September.